Silly thing… my daughter was born on the day you got married. I like coincidences. Good luck! WTF Married? LOL Right on. Wonderful! Good for you guys! It’s so weird to be amazed by learning about things that happened nearly a year ago, as you read through the archives of someone else’s life. congratulations and what an adorable snapshot. Thats Adorable! Congratulations no matter how late this is! I just started reading your comic, so I’m really late, but congratulations! Well, hey! I love your strip and I’ll keep on following your next work! Awwww! So cute together. Congrats! You should apologize to your mother for all those times you got mad when she said being a Lesbian was just a phase. I’m still attracted to women, that wasn’t a phase :) If I had not met Matt, I would still be dating women. Insanely late, like most of the rest, but Congrats! Also; “I’ve read comics about your wiener!” is the line that did me in here, lol. You got married on your birthday! You got married one month exactly before I did. Same year, too. Odd. 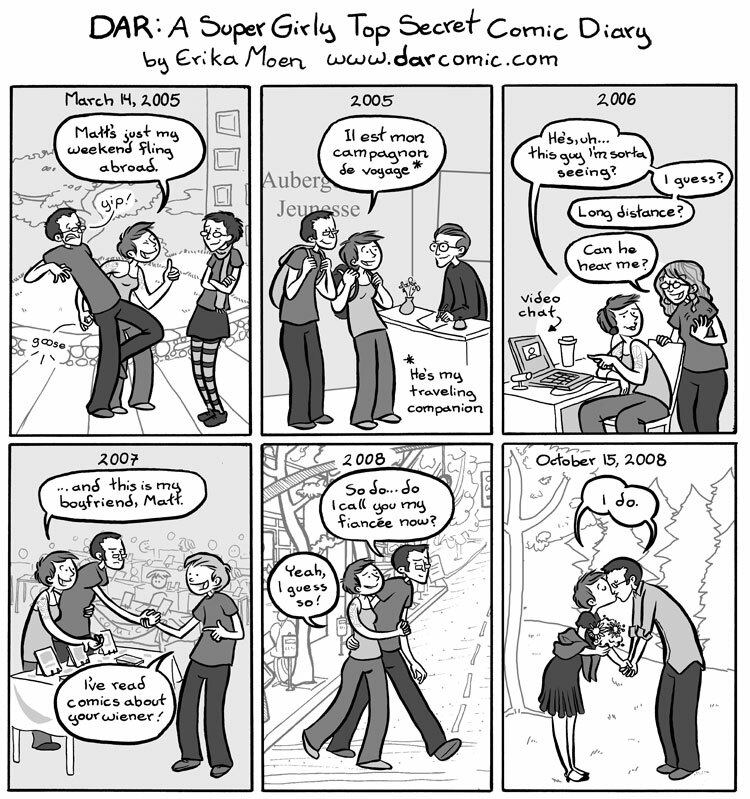 I am a recently buzzed mostly-lesbian who married my male exception and I draw mini-comics. A lot. They are not yet published. This is very spooky. I feel very self-voyeuristic reading this. You got married on my birthday.